This unique residential conference was organised at the Bogamllo’s Beach Resort, Goa from 23 to 25 February 2018 and was attended by over 160 delegates. 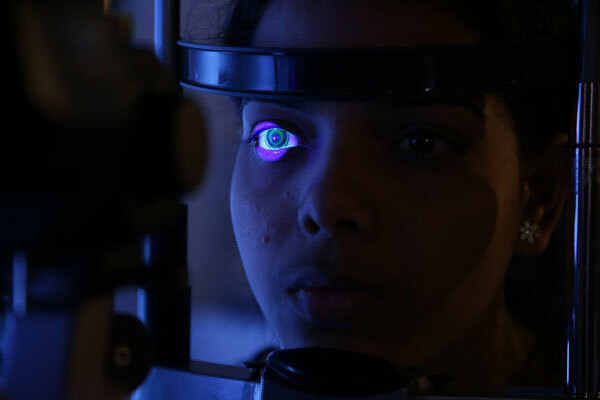 The conference was accredited by the Optometry Council of India (OCI) for 24 credits. It was generously supported by contact lens industry from India and overseas. 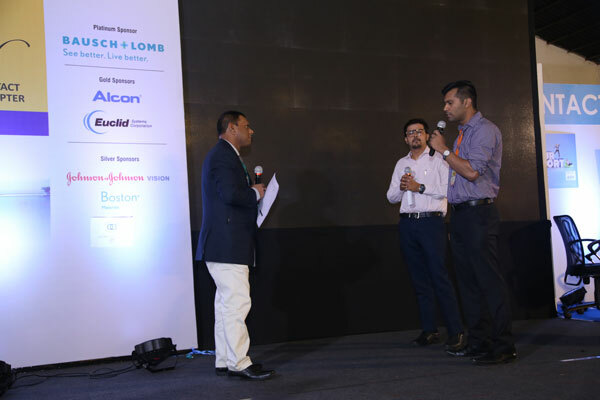 Among the sponsors were: Bausch + Lomb India, Alcon, Johnson & Johnson Vision for Knowledge Fest International and Euclid, Paragon vision sciences and Boston materials for BIPOK. 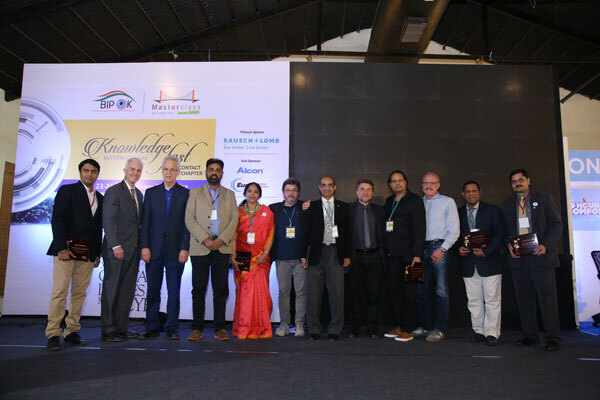 The first two days witnessed a plethora of eminent international and Indian speakers sharing their knowledge, wisdom and experience about regular and specialty contact lenses. The third day was dedicated to the current hot topic – Ortho-Keratology & Myopia Control. A unique concept of having a Contact lens clinic set up next to the stage to see the role plays of speakers’ take away messages for better retention. This clinic was set up by platinum sponsor Bausch + Lomb, India. The feast of knowledge and fun began with inauguration and lamp lighting. Carrying forward the theme of more lenses to more eyes, the first session conducted by Optom. Nilesh Thite and Optom. Yeshwant Saoji was on consumers’ expectations from eye care practitioners (ECP). According to their recently conducted study consumers are willing to spend time and money for a comprehensive eye examination. Optom. Lakshmi Shinde then discussed the importance of a standard protocol during an eye test. It is necessary to be professional in approach and perform a comprehensive eye examination. This will eventually make an impression on our patients and establish us as reliable eye care practitioners. Later Optom. Nilesh Thite shared his learnings from their recently published paper on two different approaches of contact lens (CL) recommendation i.e. the conventional proactive recommendation (CPR) and EASE approach. While CPR had better conversions from trials, the other parameters were similar in both. This instilled a thought among every practitioner that how proactively recommending CL and giving a CL wearing experience could actually benefit so many potential lens wearers. To sum up all that was learned in the previous sessions, role plays moderated by Optom. Yeshwant Saoji were performed. These role plays demonstrated to the audience what could be done in real practice. Dr Bruce Williams gave a talk on tear film and dry eye; he also introduced Xiidra as one of the recommended solutions for dry eye patients. In continuation to the topic of dry eye, Dr Nitesh Barot and Dr Cary Herzberg suggested the use of Ortho-K for dry eye. Rather than putting on the lenses the entire day, you can wear them at night. No friction, no pollution, eyes are closed. Optom Rajesh Wadhwa then put light on the topic of contact lenses for digital eyestrain and dry eye. He explained on how our eyes are working for long hours in front of the screens and how prevalent dry eye is. To identify and treat dry eye is necessary, since maximum dropouts could be caused due to a development of dry eye and the patient not wearing the lenses anymore due to discomfort. Having so many solutions in the market, it gets difficult for an ECP to understand what needs to be used and what could be best for the patient. To solve this confusion, Optom. Prasad Sawant discussed contact lens care solutions available in the market and their recommendation, use and compatibility. The post lunch session was started by Optom. Rajesh Wadhwa. He gave insights on how to make CL practice profitable. He strongly recommended not to cut down costs from the charges taken for service. You stand out because you give professional services as an Optometrist. Following this, Dr Cary Herzberg conducted a session on myopia control, its methods and its efficacy. He talked on the importance of myopia control, its various methods and gave guidance on how to advise myopia control. Then, Dr Jaume Paune discussed how we need to catch our patients young for contact lenses. With the rising population of myopes, it is safer to advise contact lenses to children. It is a myth that children are non-compliant. They will learn faster than adults. The last session for the day was a role play by Dr Nitesh Barot and team on myopia control. The role play depicted a situation wherein concerned parent of myopic child was counselled effectively by the ECP. Building on the momentum, second day began with a session by Optom. Nilesh Thite and Optom. Yeshwant Saoji. It was an interesting session on the different personality types we have to deal with. They explained how to manage different personalities and different situations that could occur in professional life through recorded videos. Then Dr Nitesh Barot and Dr. Chandrashkhar Chawan in the next two sessions talked about speciality contact lenses available, and how and in which patients they could be used, as well as the newer developments in contact lenses and the future. Further diving into speciality, Dr Marino discussed corneal topography. He explained the types and the uses of corneal topography and highlighted the importance of topography over keratometry. He depicted cases where topography is necessary or could be used in CL practice. Optom. Prasad Sawant along with his colleagues performed a role play covered various concerns of parents of a keratoconic patient, and ways to address them. Post lunch was an informative session by Dr Tom Arnold on scleral lenses and a talk on care and maintenance of speciality CLs by Dr Jaume Paune. The second day ended with two rapid fire talks. One was by OCI representative Mrs Paula Mukherjee. She gave a talk on Continuing Education and its importance in the field of optometry. The other presentation was given by two young optoms Manini Vakil and Yashaswee Bhattarai introducing their optometry awareness page and encouraging others to join their mission of creating optometry awareness among public. After two days of continuous learning, everyone needed some fun. Getting dressed up for the night everybody danced the night away at the gala dinner. The last day of the contact lens chapter was dedicated to Ortho-Keratology and myopia control. The first session of the day by Dr Cary Herzberg and Dr. Marino Formenti was a workshop on myopia control. Importance of adequate correction and myopic or hyperopic defocus caused by the working distance as well as the correction prescribed was discussed in detail. They also explained the importance of Binocular Vision assessment in a routine practice. Dr Jaume Paune and Dr Nitesh Barot discussed Ortho K lenses and how/why they work. They gave a brief about how Ortho-K lenses change the shape of the cornea and provide adequate correction. Dr Bruce Williams immediately started the talk on fitting Ortho K lenses, fitting patterns and its characteristics while Dr Jaume Paune dived deep into it. Then, Dr. Cary Herzberg highlighted the importance of Ortho-K informed consent contract and the right way to present it to patients. In the post lunch practical session, live Ortho K fitting and fitting pattern were demonstrated. Initially corneal topography was performed on the volunteer followed by fitting of Ortho-k lens on his eyes. The fitting pattern as well as corneal topography pre and post fit was shown and discussed. There was an additional full day session on Monday, 26th February 2018. A boot camp in orthokeratology was organised by the BIPOK for their members. It was attended by 20 members, who are eager to bring this exciting science to practice. Various speakers covered deeper aspects of ortho keratology like fitting based on software vs trial lenses. They also demonstrated how to design the lens using the software for myopia correction as well as myopia control. On the previous day, using the topographic information, trial lenses were fitted on volunteers. Their post fitting topographic measurements were taken and vision was demonstrated. The delegates were fascinated to see the results. The practical aspects and how to manage ortho-k practice were also discussed. 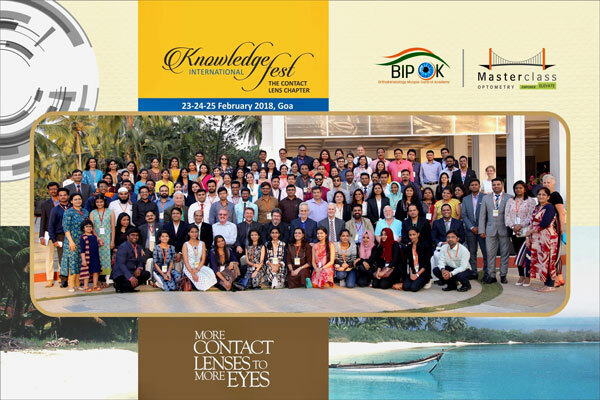 The conference provided a unique opportunity to interact with international and Indian stalwarts in the field of contact lenses. Most delegates maximised it and established connections with them. All in all, with the inspiring talks and sharing of ideas, the conference was a super hit and an enriching experience for delegates. Everybody who attended the conference went back with a lot of learning, fond memories and new friends.